Chocolate chip and snickerdoodle and sugar ... oh my! Is there anything better than a cookie? What about a free cookie? How about lots and lots of free cookies? It's the holidays and we've already got cookies on our minds but, thankfully, National Cookie Day 2018 is on Dec. 4, so you don't even need to preheat your oven to enjoy a delicious sweet treat. To celebrate, plenty of chains, bake shops and restaurants will be giving away cookies and special deals. Whether you wait all year long for your favorite Girl Scout cookies to arrive, are obsessed with Oreos (or its rival Hydrox) or won't eat a treat unless its fresh out the oven, National Today collected some fun facts that will make National Cookie Day your favorite food holiday. Through a few surveys, the cookie experts discovered that 54 percent of Americans prefer homemade cookies. More than a third of Americans (43 percent) have eaten a "whole row of Oreos" in one sitting and close to one in 10 Americans have never baked their own batch of cookies. Well, there's no better time to start baking cookies, folks. On National Cookie Day, everyone is welcome to enjoy cookies that they don't have to bake in their own kitchens. Here are the top spots to steal a deal. You don't have to be a hotel guest to enjoy one of the chain's delicious warm cookies on National Cookie Day. DoubleTree has almost 500 locations nationwide so there's a good chance that there's a hotel near you. Just stop by the front desk to enjoy a sweet snack. This national chain that serves up freshly baked cookies is handing out one free cookie (its original chocolate chip) to anyone who pops in. There's no purchase necessary but there is a limit of one per person and not all stores may be participating. Insomnia Cookies is actually celebrating National Cookie Day all week long. From Monday, Dec. 3 through Monday, Dec. 10, fans can even enter online to win a year's worth of free cookies. On Dec. 4, stores will give guests one free cookie at all of its 145 locations. 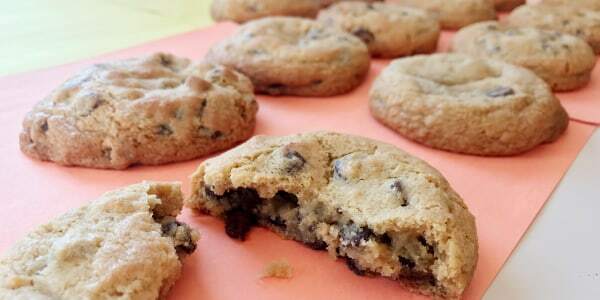 If you can't get to a store, you can still receive a free cookie with your delivery order. Customers can also score 20 percent off all online orders. At Mrs. Fields, National Cookie Day is a great day to stock up on a sweet stash of holiday gifts if you don't like baking cookies yourself. This cookie chain will honor National Cookie Day with up to 40 percent off holiday cookie tins on its website, as well as one free cookie with an in-store purchase on Tuesday, Dec. 4.